The InLoox PM project list provides you with various features that make project editing easier and faster. As a standard, you can see only those projects in the project list that are accessible for you. Access quickly the last project Click Recent Projects in the InLoox PM group. Select from the dropdown list the project you wanted. Categorize a project In order to assign a category to one project (e.g. circular project or new business), click Categorize in the Tags group and choose one category in the context menu. You can also create your own category for your projects. For further instructions on how to create your own categories, see Manage categories. Set a priority You can set the level of importance of a project. In the Tags group select a Low or High priority. Archive a project Move a marked project via Archive to the InLoox PM archive view. Change the view of the project list Select between List and Cards view in the Arrangement group. Double-click to open a project. Filter the important project information Click Filter in the Current View group. To learn more about filter feature, see Search and find in a project. Define an early warning system Click Conditional Formatting in the Current View group. Now you can highlight columns according to personalized rules. 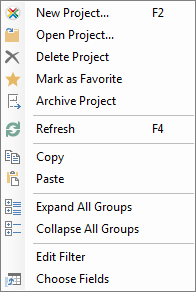 Create a new project list view Click Save in the Current View group, after you have adjusted the project list. To learn more about views, see Generate personalized views. Work Package Pane Provides you an overiew of the work packages on the side panel no matter wich Outlook folder you now use. To learn more about it, see Manage the work package view, in the Work package side panel section. Project list features in InLoox PM 8 • Copyright 1999-2019 © InLoox, Inc. All rights reserved.